It is not too long ago that I’ve written about the results of the first PRISE study (Arciero. 2014) on Facebook. In said study, the subjects, your average overweight to obese individuals, had been advised to use a protein-pacing strategy (P; six meals/day @ 1.4 g/kg body weight (BW), three of which included whey protein (WP) supplementation) combined with a sane multi-mode fitness program consisting of resistance, interval sprint, stretching, and endurance exercise training (RISE) to improve their composition – with quite astonishing results, by the way (Arciero. 2014). More specifically, the subjects in the PRISE (vs. RISE = only exercise) arm of the study lost more more body weight (3.3 ± 0.7 vs. 1.1 ± 0.7 kg, P + RT) and fat mass (2.8 ± 0.7 vs. 0.9 ± 0.5 kg, P + RT) and gained (P < 0.05) a greater percentage of lean body mass (2 ± 0.5 vs. 0.9 ± 0.3 and 0.6 ± 0.4%, P + RT and P, respectively | read old FT). 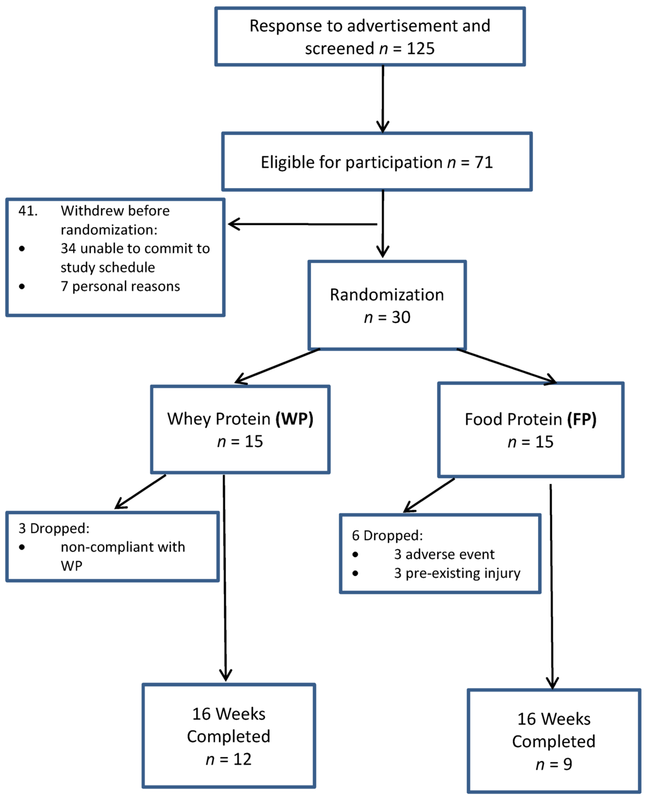 The purpose of Arciero’s newest study was now to “extend these findings and determine whether protein-pacing with only food protein (FP) is comparable to WP [whey protein] supplementation during RISE training on physical performance outcomes in overweight/obese individuals” (Arciero. 2016). To this ends, the scientists recruited thirty weight-matched volunteers who were prescribed either RISE training and a P diet derived from whey protein supplementation (WP, n = 15) or RISE training a P diet with food protein being the major protein sources (FP, n = 15) for 16 weeks. Both interventions involved the previously discussed ingestion of six small meals, each day containing ~20–25 g of a high quality protein source. Table 1: Sample Menus from the FP and WP nutritional intervention diet plans during the 16 week PRISE intervention. Menus were similar in macronutrient distribution (Arciero. 2016). As you can see in Table 1, the sources of said 20-25g of protein differed significantly between groups; with eggs, greek yogurt, fish, poultry, beef, cottage cheese and other natural and rather slow- digesting protein sources replacing the fast-digesting whey protein (Classic Whey; Optimum Nutrition) from the previous study / in the current whey protein arm of the study. “For all meals, participants were provided with a menu of foods from which to choose. Examples included milk, Greek yogurt, eggs, lean meats, fish, poultry, and specific plant sources, including legumes, nuts, and seeds. The number of recommended daily calories to consume was estimated to match the caloric requirements of each individual as measured by resting metabolic rate and measured/estimated physical activity level but was ad libitum, and not energy-restricted. Both groups followed the same protocol in terms of the timing of meals: all meals were evenly spaced throughout the day and one meal was consumed within one hour of waking in the morning and another two hours prior to bed. On exercise days, both groups consumed a protein meal (20–25 g) within 60 min [PWO, as bros’d call it ;-] after completion of exercise. For WP, they were required to consume this meal as 20–25 g of whey protein giving them a total of three servings of whey on exercise days. For FP, this required a protein-rich food meal of 20–25 g. On non-exercise days, both groups consumed similar amounts of total protein at each of their six meals per day” (my emphasis in Arciero. 2016). Figure 1: CONSORT (Consolidated Standards of Reporting Trials) flow chart of participants during the study intervention (Arciero. 2016). The training program consisted of four specific types of exercise: (1) resistance training; (2) interval sprints; (3) stretching/yoga/pilates; and (4) endurance exercise (RISE training; Supplementary Materials Table S2). Subjects underwent four exercise sessions / week, and the sessions rotated through the four types of exercise, such that each of the four exercises was performed one day/week. The resistance (R) training sessions were completed within 60 min and consisted of a dynamic warm-up, footwork and agility, lower and upper body resistance, and core exercises performed at a resistance to induce muscular fatigue in 10–15 repetitions and for two to three sets (in other words: they trained to failure). A 30 s recovery was provided between sets and a 60 s recovery was allowed between different exercises (and they still grew | cf recent post on short rest). The sprint interval (I) training sessions were completed within 40 min and consisted of 5–10 sets of 30–60 s of all-out exercise (remember “all-out” for an overweight untrained individual is miles away from “all-out” for an athlete, though) interspersed with 2–4 min of rest after each exercise. Participants were allowed to perform the sprints using any mode of exercise (treadmill, elliptical machine, stationary bikes, swimming, snowshoeing, cycling, rollerblading, etc.). The stretching/yoga/pilates regimen was based on traditional yoga poses with modern elements of pilates training for a total body stretching, flexibility, and strengthening workout. All sessions were completed within 60 min and were led by a certified yoga instructor (PJA). It should be pointed out that it is not clear how important this part of the regimen was, but previous research indicates that yoga can actively reduce the ill effects of chronically elevated cortisol down (Kamei. 2000) and may thus help restore the natural “downs”, which are required for the fat burning (yes, you read me right!) cortisol spikes. Finally, endurance exercise training was performed for 60 min or longer at a moderate pace (60% of maximal effort). Participants were allowed to choose from a variety of aerobic activities, including walking, jogging, cycling, rowing, swimming, etc. To make it easier to grasp, I’ve included a tabular overview of the workout in Table 2 of this article. Here, RPE is, as usually the rating of perceived effort; C the choice of exercise modality; WB whole body exercises; S is stretching exercise; and the Xs, are exercise days. Ah, and not to forget, the Exercise modalities available for C aka cardio were running, cycling, swimming, elliptical, rowing, cross-country skiing, etc. Table 2: Overview of the subjects’ workout schedule (Arciero. 2016). As you can see, the body composition and the physical performance (Figure 3) significantly improved in both groups, regardless of whether the protein came from fast digesting leucine-packed whey protein or common (albeit high essential amino acid aka EAA food sources | p < 0.05 for the effect on performance and body comp, not the inter-group difference!). Is this for athletes, too? The scientists think so, read their 2015 review of the literature discussing why “PRISE” may benefit not just the biggest loser, here – for FREE (Arciero. 2015)! Now, this is not exactly surprising, what may come as an unwanted surprise for the protein supplement industry, though, is the fact that there was no effect of protein source on either the changes in body composition – including the reduction in visceral fat, where the “whey advantage” does yet point to a potential benefit of increased GLP-1 levels in response to fast(er) digesting proteins (read further to learn more reasons). As the authors point out, there were likewise no significant differences in the performance markers (see Figure 3) or the health-relevant markers of cardiometabolic disease risk (e.g., LDL (low-density lipoprotein) cholesterol, glucose, insulin, adiponectin, systolic blood pressure), which significantly improved (p < 0.05) to a similar extent in both groups. The reason it is still worth taking a closer look at the latter is that the higher baseline insulin and triglyceride levels in the whey protein group (171.8 ± 29.8 vs. 94.2 ± 8.5 mg/dL and 21.7 ± 10.5 vs. 9.6 ± 2.3 μg/dL, respectively) could explain the higher visceral fat loss despite identical food and protein (1.6-1.7g/kg) intakes in the whey protein group (see Figure 2) – at least some of the subjects who had been randomly assigned to the were simply significantly more metabolically deranged. 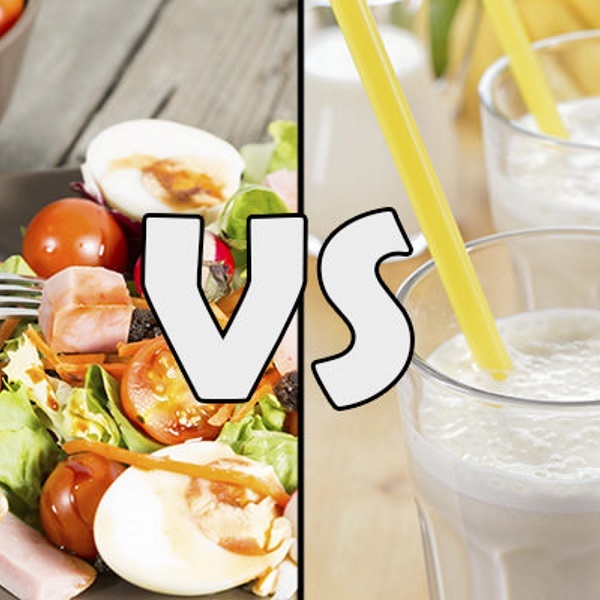 Compared to whey protein, food proteins suppress hunger more effectively (Arciero. 2016). So what? Well, there’s little doubt that the scientists’ conclusion that their “results demonstrate that both whey protein and food protein sources combined with multimodal RISE training are equally effective at improving physical performance and cardiometabolic health in obese individuals” (Arciero. 2016) is accurate and not debatable. That obviously does not mean that you cannot or should no longer use your protein powders (whey studies). What the results do indicate, though, is that previously untrained individuals (confirmation in athletes is warranted) are not missing out on performance gains or improvements in body composition if they cover their protein needs with regular high protein foods instead of supplemental whey protein – regardless of its faster digestion and higher leucine levels. Arciero, Paul J., et al. “Timed-daily ingestion of whey protein and exercise training reduces visceral adipose tissue mass and improves insulin resistance: the PRISE study.” Journal of Applied Physiology 117.1 (2014): 1-10. Arciero, Paul J., Vincent J. Miller, and Emery Ward. “Performance Enhancing Diets and the PRISE Protocol to Optimize Athletic Performance.” Journal of nutrition and metabolism 2015 (2015). Arciero, Paul J., et al. “Protein-Pacing from Food or Supplementation Improves Physical Performance in Overweight Men and Women: The PRISE 2 Study.” Nutrients 8.5 (2016): 288. Kamei, Tsutomu, et al. “Decrease in serum cortisol during yoga exercise is correlated with alpha wave activation.” Perceptual and motor skills 90.3 (2000): 1027-1032.